In the fight against the phishing, Google has developed a new tool which is the free Password Alert Chrome extension tool. This tool helps to keep a track everyplace a user enters their Google account password and at the same time it alerts that they might have entered their password in a website other than that off accounts.google.com. The new tool has two types of capabilities, it will preventing the user from using their Google password on any other websites and it also protects a user from entering their Google password on a website that might have been act as if to be Google to collect private user information, this act is called as Google. It is an act wherein an individual or group tries to pose as a legitimate organization or company to gather your private information. This information includes social security number, passwords and even the credit card numbers. One such attack can be considered when a user get an email from a third party posing to be Google and requesting you to enter your account details and links it to malicious websites. 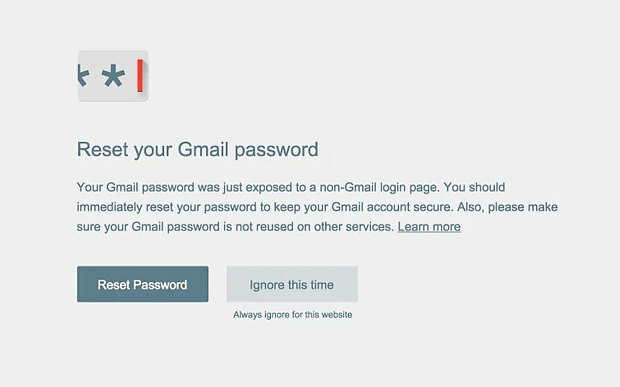 Now considering this tool, even if you enter your password, a Password Alert will pop indicating that your password of Google might have been exposed to a non Google account or email. In this case the users are urged to change the password of their account immediately. The users will get this message as soon as they enter the last digit or alphabet of their password and this will work even if you are trying to create a new account. Password Alert tool can be easily downloaded from Chrome Web Store and needs to be installed on the system. Once installed the tool extension will request for the username and password of the user’s Google account. This will also happen even if the user is already logged into his or her account. Once enabled be ready to get alerts and notifications whenever you enter password in non Gmail accounts. Users can ignore the alerts if they tried using the password of safe websites like Facebook or Amazon. Most of the time, Gmail username and passwords are used for resetting of passwords of different accounts making the Gmail account the prime target. Especially for those hackers who are just waiting to get their hands on your private information. Reports suggest that nearly 2% of the emails that are sent on your Gmail account are phishing attempts. Even though Gmail have been successfully trying to phish these emails from your account, but millions of other email senders are trying to get your information and password. The company tested the new tool by carrying out a test called the internal penetration tests which involved attacking the accounts of their employees and then attempt to improvise of their security measures. When it comes to confidential websites of Government, these phishing attacks can be quite devastating.